Involves promoting laws and practices that protect freedom of opinion and expression. Encourage partner countries to initiate legislative changes for FoE. Public statements in reaction to legislative changes that harm FoE. Engagement with UN agencies, forums and support for UN agenda. 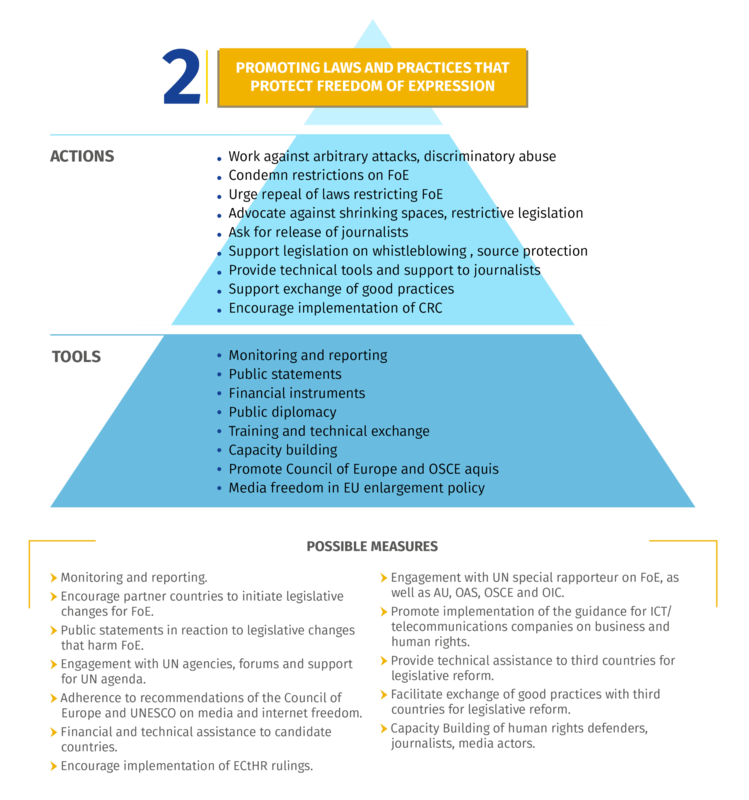 Adherence to recommendations of the Council of Europe and UNESCO on media and internet freedom. Financial and technical assistance to candidate countries. Engagement with UN special rapporteur on FoE, as well as AU, OAS, OSCE and OIC. Encourage implementation of ECtHR rulings. Promote implementation of the guidance for ICT/telecommunications companies on business and human rights. Provide technical assistance to third countries for legislative reform.Facilitate exchange of good practices with third countries for legislative reform. Capacity Building of human rights defenders, journalists, media actors.